← THE TRAGEDY OF THOMAS BUNGELENE: ABORIGINAL SEAMAN IN THE VICTORIAN NAVY. Frederick Prentice MM died in Katherine, Northern Territory on 22 November 1957 unknown and without family or friends. Using the fact that Prentice had told a fellow worker that he had served in World War One, the Acting Superintendent of Police, Northern Territory asked AIF Base records for help in identifying his next of kin. The information the police already had was that the dead man was half Maori and had died of a heart attack. In fact according to Eric Catterall descended from a branch of Prentice’s adoptive family he was also recorded as having second degree burns to one side of his body – consistent with rolling into his campfire, a not uncommon occurrence. Base Records was able to identify Prentice but by 1958 all links with his family and former life had gone. News items in South Australian papers show that his farewell before leaving for the front in 1915 was a stylish occasion. Prentice who was an athlete, excelling in football, cricket and running, would have cut a dashing figure in his uniform – almost six feet tall and well built according to the details recorded in his attestation. Four years later his safe return was recorded by another paper. Frederick Prentice was born about 1894 at Powell Creek, Northern Territory. His father, Alfred Leslie Prentice was Justice of the Peace at Powell Creek at the time of Frederick’s birth. Alfred Prentice came from Victoria and was variously a drover, station manager, station owner and mail contractor in the Northern Territory. Frederick’s mother was an as yet unknown Aboriginal woman. The name Prentice can be found associated with several other Aboriginal people born in 1900 living at Elliott near Powell Creek and Newcastle Waters and identifying with the local Tjingili/Jingali people, suggesting that Frederick was not Alfred Prentice’s only child. Alfred died in 1916 probably unknown to Frederick who was serving in France. Frederick’s early childhood was spent at the Powell Creek Overland Telegraph Station with the stationmaster Walter (known as Dan) Kell and his wife Isabella nee Birkett, who arrived there in 1896. The Kells had no children of their own and adopted Frederick and another Aboriginal child, a girl. Isabella who was 43 when she married Kell, her second husband, was a nurse and formerly a respected matron at Palmerston hospital. There is an air of comfort about this Station in great contrast to the batchelor quarters of the Tennant and Barrow Creek. The verandahs are broad and strewn with great easy chairs that present an inviting appearance to the weary traveller …The Station is picturesquely situated on the bank of Powell Creek just where it junctions with a smaller creek called the Kintore; looking to the north the eye rests upon a scene of almost tropical luxuriance: around a spring on the bank of the creek a variety of trees are growing and one very fine tree, bauhinia, is near to us. Peeping out from behind the trees are rows of banana plants, some with yellow clusters of fruit hanging from them, the whole making a decidedly pleasing and refreshing picture after the arid dreariness of the track. 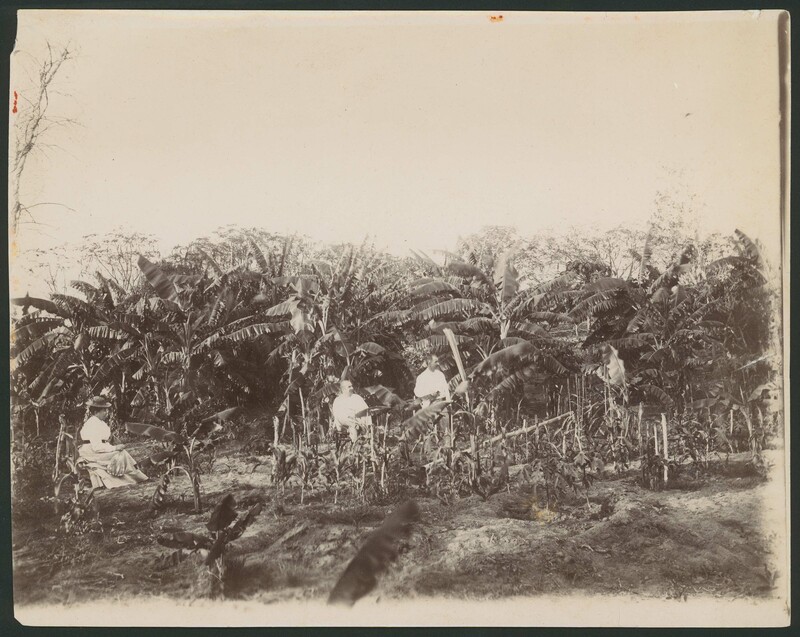 In the afternoon I stroll with kindly Mrs. Kell in the garden and eat bananas fresh from the trees … We discuss Mr. & Mrs. Kell and vote them both jolly good fellows and regret that we cannot find an excuse to devote a month or two to the Chingilli tribe – and the Kells. p.269. The reason for Spencer and Gillen’s visit to Powell Creek was to study the Aboriginal people in the area, the Tjingili, several of whose camps were close to the station. Spencer took many photos of the place and some of its people and also recorded ceremonies which he said occurred every day. 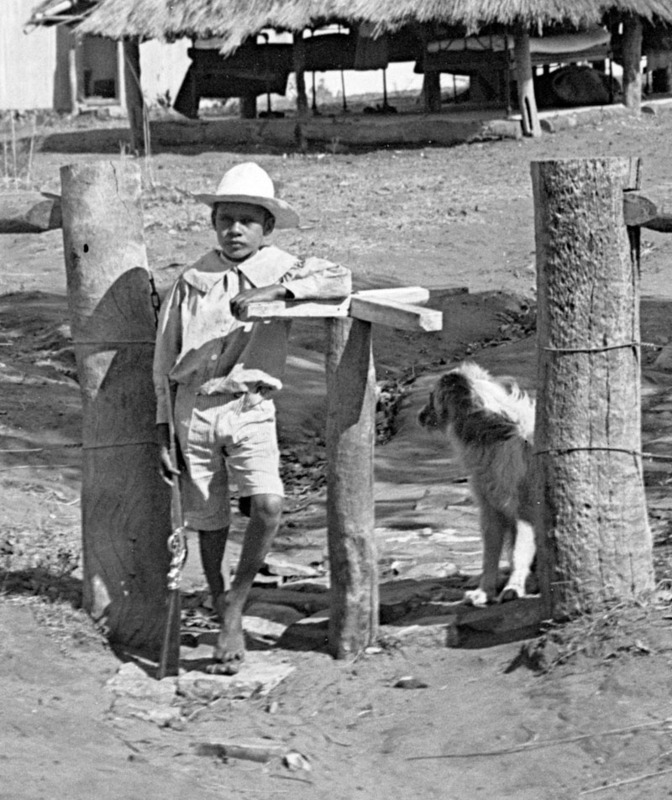 The photos include a number featuring a small Aboriginal boy and his dog. He wears European clothes and is almost certainly Frederick Prentice. His mode of dress compared with the Spencer’s other subjects underlines his separation from his culture. Also visiting Powell Creek in 1901 was the Bishop of Carpentaria who commented on Frederick and his sister. Mr. and Mrs. Kell have with them two half-caste children, of whom the Bishop of Carpentaria (Dr. Gilbert White), who visited Powell’s Creek in 1901, wrote in his journal under date July 7:-“At morning prayer I baptised two half-caste children. The future of these half-castes is a serious question. When young they often receive some kind of education and training, but the danger is lest they should be thrown on the black’s camp when they grow too old to be treated as children.” Mr. and Mrs. Kell have determined that their adopted children, whose intelligence is remarkable, shall be educated in the best schools available. Advertiser 17 August 1905.
necessity of steps being taken to convert these people into useful members of the community, instead of allowing them to grow up in the camps, where they acquire the lazy habits of the aborigines which unfits them for any regular occupation. The Kell’s actions although no doubt aligned with this thinking had a personal element. Not only was it unlikely that they would have children but Alfred Prentice was a friend of both Walter Kell and his brother-in-law Waldemar ‘Wallaby’ Holtze who also lived at Powell Creek. What is unknown are the circumstances Frederick lived in prior to his association with the Kells. He could have lived with his father or what is more likely in one of the adjacent Tjingili camps. The whereabouts of his mother who was probably a Tjingili woman, her wishes or even whether she was still alive when Frederick joined the Kells are also unknown. In 1905 Frederick’s life changed. The Kells moved to Adelaide when Walter Kell became senior telegraphist at Unley and true to their word and no doubt to the gratification of the Bishop, sent Frederick to Kyre College, the predecessor of Scotch College also in Unley. Here he excelled in athletics and won a prize for music. In 1914 when Frederick was 20 Walter Kell was appointed postmaster at Wallaroo also in South Australia. Frederick, who in 1915 was working as a station hand at Manunda gave his sister Isabella Kell of Wallaroo Post Office as his next of kin when he enlisted in May indicating his continuing association with his adoptive family. Eric Catterall and Christine Cramer whose great great great uncle was Walter Kell have traced Frederick’s later life via electoral rolls, newspaper reports and information in his service record. These shows that he returned to Manunda station after the war and remained there until at least 1926 perhaps not coincidentally the year of Isabella Kell’s death. Walter Kell died in 1919. His engagement with the community is demonstrated by his appointment in 1926 as clerk of scales at the Yunta races. By 1930 he was working as a miner in Kalgoorlie where he stayed for thirteen years. Here during the 1930s he participated in local sporting life as a valued team member. He played cricket and was a high scorer for the Kookynie Cricket Club and as well as playing for Shenton in the Menzies Football Association competition. Comments like that of the official who said that ‘as soon as he can get F. Prentice into the ruck he will have a team that will waltz all over to triumph and victory’ attest to the quality of his game and his reputation. He was also a paid up member of the Australian Workers Union until at least 1940 and was made AWU representative for Comet Vale in 1937. Between 1943 and 1957 his life seems less stable. During this time he worked in mines at Westonia, Comet (Marble Bar) and Blue Spec (Nullagine) where in 1951 he was described as ‘an old hand’. His name no longer appears on electoral rolls after 1958 the year following his death. The information provided to AIF Base Records in that year by the Northern Territory police paints the picture of a sober and solitary man. This person had only been in Katherine about three weeks and did not associate with any other person in the town or frequent hotels. He was known to only one other person in the town a man named Weatherall who claimed that the man was called Fred Prentiss and that he had worked with him at various places in Western Australia. However he knew nothing of Prentiss background from where he a came if he were married or the name of his next of kin but he said that Prentiss had told him he was in the first world war and served with a South Australian regiment. AIF Base records could give the superintendent no more than the information in his service record. The early deaths of his foster parents and probably his sister according to family story and the fact that the Kells had no natural children meant that he had no immediate known relatives. There is no evidence that Frederick married or had children. He seems to have lived an increasingly solitary life moving around Western Australian mining towns until his death in the Northern Territory. Frederick Prentice’s story has some parallels with that of World War One Aboriginal servicemen like William Punch, George Aitken and Douglas Grant all of whom became dissociated from their Aboriginal families and culture and were brought up in European families. Aitken and Punch died in World War One. Douglas Grant survived. Like Prentice he lost his immediate foster family leaving him in a family sense virtually alone. Both Prentice and Grant were men of character, athletes and educated and neither married. Both men at times occupied positions which show they had the confidence of others – Grant as a spokesman in the German camp where he was held prisoner and later as secretary of the Lithgow RSL and Prentice as a race official at Yunta and an AWU representative. As Aboriginal men brought up in a white world and unable to connect with their Aboriginality, family and culture both men’s lives had deep tragic elements. Almost certainly Grant and Prentice would have been subject to the prejudice of racist white Australia. The reports describing Frederick’s departure and return to Australia show him as respected and part of the community he lived in. Significantly they do not refer to his Aboriginality but do mention his friends and adoptive parents. This situation is unlikely to have continued as he worked his way round Western Australia mixing with people who knew nothing of him and his white family, despite the personal qualities which gave him some recognition as a sportsman and in his union. Separated from both his Aboriginal and his adopted family he would have been very much alone. What is different about the experience of Douglas Grant and Frederick Prentice is that Frederick spent his early life living close to the Tjingili camps and his own people, in earshot of their ceremonies but distanced by the fact of his adoption into a white family. This differentiates him from Grant who was taken to New South Wales from Queensland far from his people and makes the situation of the solemn faced little boy shown repeatedly in Spencer’s photographs even more poignant. 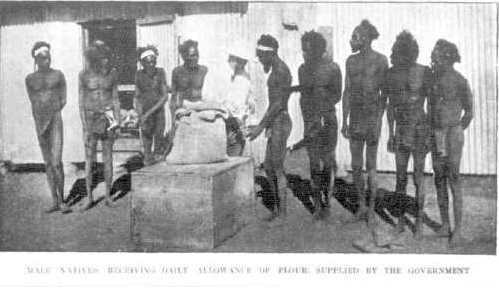 Walter Kell distributes flour to Tjingili men at Powell Creek, 1902 to. Chronicle November 1902 p.42. Frederick’s adoption by the childless Kells was no doubt emotionally rewarding for them and considered to be in that ambiguous and discredited phrase ‘in the best interests of the child’. By ‘saving’ him from camp life his adoption satisfied the sensitivities of the people aware of the particulars of the white side of his heritage. He was educated and secured employment as desired by people like the Bishop of Carpentaria but at the same time he was denied access to his culture and his extended family. It is impossible to know how different his life could have been but it is likely, should he have avoided removal by the state, that it would have at least involved a sense of identity and an absence of the loneliness and disconnectedness inherent in the circumstances of his death. In the 21st century as a result of extensive research by Eric Catterall and Christine Cramer, something of his story is at last being uncovered. Their ongoing research which was originally prompted by comments made at a 1991 family reunion that Isabella Kell had adopted two Aboriginal children, has had rich results. Of course much is still missing but as a result of their efforts it is now possible to gain an impression of the man and the forces which shaped him and affected his life. One other avenue remains to be investigated. It is conceivable that there are descendants of Alfred Prentice alive to day. The existence of other Aboriginal people named Prentice in the Northern Territory suggests that it may be possible to trace some Aboriginal people who are related to his son Frederick. In 2014 Frederick Prentice lies in an unmarked grave in Katherine cemetery. There are moves to identify this with a headstone recording his story and war service. Perhaps it will also be possible to find members of his Prentice family who could visit his grave in what would be a belated recognition of his family and identity. I’d like to thank Eric Catterall and Christine Cramer for alerting me to Frederick Prentice’s background and for sharing their research without which this post could not have been written. PS I was completely unaware of the Spencer and Gillen references and I am entranced by the image of the younger Fred with a pea shooter. John It seems Eric Caterall and Christine Cramer have undertaken research in parallel with your own. As I mention in my post they are descendants of Walter Kell’s father and found out about the existence of their foster relatives Frederick and his sister at a Kell family reunion in 1991.Their research into Frederick’s sister has not been so successful. I am very happy to acknowledge NTL research which covers the same ground. My post is not intended to imply no others have been interested in his story – I gather you are the author of the NT website information. Eric and Christine’s long and determined research has come from a family perspective. There is an ambiguity about whether the next of kin nominated in his service record is his sister or refers to Isabella Kell’s status as nurse. Eric and Christine based on information In Frederick’s pay book judge that in fact he is referring to his sister. I sympathise with NTL who as you say do much with little – sad to say a not uncommon situation. Can you tell me how you first came across Frederick Prentice’s name as an Aboriginal WW1 soldier. Genealogical Society of the Northern Territory published a draft list of NT Anzacs many years ago, In their journal. Frank Geddes worked on this for many year, from microfiche and microfilm records. That was our starting point. They were about 90% right! which is amazing. We made a lot of the connections through TROVE, because the NT papers were the first ones completely digitised. The South Australian papers were not available when we did most of the research. We were not specifically looking for indigenous servicemen. They were all Territorians. I found the story of Alexander McKinnon and Fred particularly poignant. The Garr family also captured my feelings, though they are not indigenous. I felt a similar admiration for Alf O’Niell, although I am not sure he is indigenous either. I think the Territory boys are an interesting group, and Paul Rosensweig captures their spirit quite well. Telegraph Station and adopted two half caste children. Isabel Jane Kell nee Birkett was Walter’s wife not Frederick’s sister. In 1905 the Kells’ returned to Adelaide where the children were educated. Walter was later Postmaster at Wallaroo and died in 1919. The Kell’s had no children of their own. Who did you send the email to? I responded to your request for more information at the bottom of Frederick’s page. If you look at the page you will see the contents of my email have been pasted in. John, I personally have been researching my family tree since 2006, before the publication online of the WW1 records by the National Archives and was a user of the beta release of the Australian Newspapers. I have also been a subscriber to findmypast and Ancestry (since 2006) and am a member of a number of historical societies including the SAG. By the time my sister and I saw the Territory Stories site we had found all the information it contained on Frederick independently. However, I thought it worthwhile adding what we had discovered on Frederick’s baptism, his parentage and adoptive family. We freely share all our research and never ask or expect any acknowledgement. Our only motivation in sharing our research with Philippa and you was the hope of recognition for Frederick. G’day, this is a wonderful post. Congratulations to you all for the work you have put into this. You may be aware of the Aboriginal and Torres Strait Islander War Memorial in Adelaide which was dedicated last November. As well as researching Aboriginal South Australians that have served (particularly those of WWI, but all service really), I served on the Memorial committee and am the Registrar of Aboriginal Veterans of SA (RAVSA) http://www.reconciliationsa.org.au/learn/ravsa. We are currently developing a project, in conjunction with the RSL, Reconciliation SA and History SA, which will be a travelling exhibition of panels with biographical information and medal sets etc. We already have two very successful travelling exhibitions of the South Australian WWI VC recipients, and SA WWII and Vietnam VC and GC recipients, called “Bravest of the Brave” 1 & 2. http://community.history.sa.gov.au/files/resources/exhibitions/6454-bob-flyer.pdf Our new project will feature SA Aboriginal and Torres Strait Islander veterans, and one of the names we have selected to form part of the exhibition is Frederick Prentice MM. Of course, we claim him too (even though he wasn’t born here, because he spent so much of his life here, went to school here etc…). So this is a very timely post! We would like to establish links (I have corresponded with Philippa in the past) with anyone that can help us develop the biographical information, obtain photographs etc for his panel. I can also tell you that Frederick’s name is engraved on a paver at the Memorial, and would be happy to email you a photo of it. There is a possible Aboriginal Soldier that received the Belgium Croix De Gurerre for bravery in battle, Cpl Ewan “Huie” Rose. I heard of him through Dr Dale Kerwin who sent me a list of Aboriginal & TSI servicemen which helped me identified a couple of Aboriginal soldiers that served in Australian Special Forces. Huie did in fact receive the Croix De Guerre for the King of Belgium. He said he was born in Brisbane but unclear whether he was aboriginal or islander descent. Thank you Damien. I mention Ewan Rose in my book Aboriginal and Torres Strait Islander Volunteers for the AIF: the Indigenous Response to World War One first published in 2011 and I also reproduce his photo. I’d be interested to see Dale’s list and to know if this is a referenced one – there are many list’s circulating of varying accuracy. You welcome, where can I purchase your book? And is there any website where you can see a picture of Ewan Rose? Yes I will be more than happy to send you the list. I can supply you with a copy of my book. It costs $30 plus postage. Could you email me on indigenous.histories@netspeed.com.au. Hi, my name is Virginia, my great great grandfather took Ewan into care as early teenager. I would be interested to know anything of his war record. His buried with family members at St Mary’s. It shows he gave his next of kin as friend CC East. Is this some one you have heard of? It would be good to find out what happened to his Croix de Geurre and exactly where he is buried. Your comment shows his memory lives on in your family.